Birdwatchers, conservationists and eco-tourism promoters from all over Asia and elsewhere had their eyes on the Philippines, which hosted Asia’s first-ever region-wide bird festival. 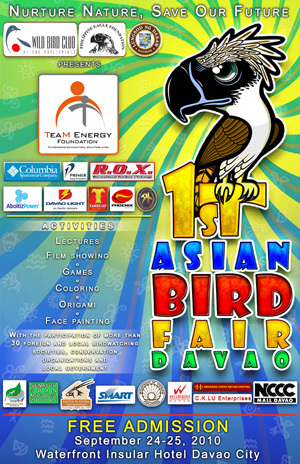 The First Asian Bird Fair was held in Davao City from 24-26 September 2010, tandem with the 6thPhilippine Bird Festival, the country’s premier avian conservation and eco-tourism event. The milestone event was co-hosted by the Philippine Eagle Foundation and the Davao City government. The First Asian Bird Fair-themed “Nurture Nature, Save our Future”—is a common initiative of the Wild Bird Club of the Philippines, the Bird Conservation Society of Thailand, the Chinese Wild Bird Federation, the Wild Bird Society of Taipei, the Malaysian Nature Society and the Nature Society (Singapore). The Asian Bird Fair, which highlights the respective bird festivals of the participating countries, seeks to enrich eco-tourism through birdwatching and promote the natural and cultural heritage of host cities. 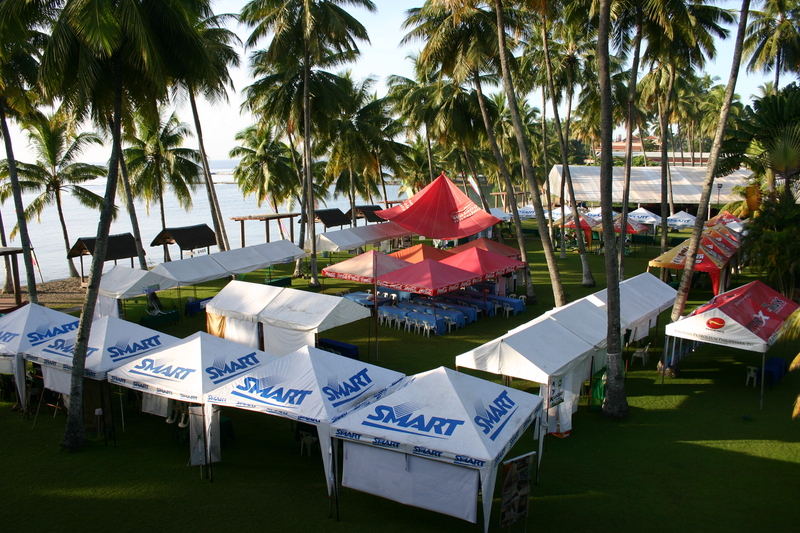 The Asian Bird Fair and 6th Philippine Bird Festival was held at the Waterfront Insular Hotel Davao on 24-25 September. Entrance to the Asian Bird Fair exhibit area was free of charge. Highlights of the fair included the Bird Conservation Forum and turn-over ceremony to representatives of the Chinese Wild Bird Federation, host of next year’s Asian Bird Fair in Tainan City. International and Philippine delegates also toured the Philippine Eagle Center and Eden Garden Resorts while in Davao. The fair included photo exhibits, presentations and fun activities for the young “and young at heart.” Children were also treated to a guided tour at low tide of the tidal flats fronting the Waterfront Insular Hotel, where they had a close look at marine species like fiddler crabs and mudskippers as well as spectacular views of herons, egrets and shorebirds. The event drew bird watchers, conservationists, eco-tourism promoters, sustainable development providers, and nature lovers from around the country, Asia and Europe. Alice Villa-Real, chair of the committee organizing the 1st Asian Bird Festival and 6th Philippine Bird Festival., said the latest initiative is a significant move to draw attention to pressing conservation issues. “We can make a significant difference to protect the rich bird life and habitats of our islands, whilst promoting responsible enjoyment of nature and encouraging related sustainable businesses in the local communities,” Villa-Real pointed out. International groups who participated in the Asian Bird Festival included the Chinese Wild Bird Federation, Bird Conservation Society of Thailand, Malaysian Nature Society, Nature Society of Singapore, Wild Bird Society of Taipei, Shanghai Wild Bird Society, Wild Bird Society of Tainan, Hong Kong Birdwatching Society, Asian Raptor Research and Conservation Network, Borneo Bird Club, Hornbill Research Foundation, the Biodiversity and Nature Conservation Association, Bird Conservation Nepal and the Oriental Bird Club. Local organizations that took part included Conservation International, Fauna and Flora International, Katala Foundation, WWF-Philippines, Isla Biodiversity Conservation, Birding Adventure Philippines, Kaakbay, Malagos Garden Resort, Monfort Bat Cave & Conservation Foundation, Philippine Association of Wildlife Veterinarians, Philippine Wild Bird Photographers, My Zoo Foundation, Earth Island Institute, City of Alaminos (Pangasinan), City of Balanga (Bataan) and the Municipality of Candaba (Pampanga). Event sponsors included the Philippine Eagle Foundation, the City Government of Davao, Team Energy Foundation, Primer Group, Aboitiz Power, Davao Light, Tanduay Distillers, Phoenix Petroleum Philippines, Ministry of Foreign Affairs – Taiwan, Fauna and Flora International, Senator Juan Miguel Zubiri, Philippine Association of Wildlife Veterinarians, C. K. Lu Enterprises, Smart Communications, Department of Tourism, Waterfront Insular Hotel Davao, Grand Men Seng Hotel and NCCC Mall. Posted on August 21, 2015 April 14, 2016 by asianbirdfair2010Posted in 1stAsianBirdFair, Nature, PhillipinesTagged asianbirdfair, featured.